▪ Windfields Farm was a 1500 acre thoroughbred breeding farm founded by businessman, entrepreneur, and philanthropist, E.P. Taylor. In 1950 he purchased what was then named Parkwood Stables, from Col. R. S. McLaughlin. ▪ Horses of international fame were bred at Windfields Farm including Nearctic, Victoria Park, Nijinsky, The Minstrel, and Vice Regent. ▪ After Mr. Taylor's death in 1989, downsizing of the farm began with large parts of the property being sold. Windfields Farm ceased operations entirely in 2009. The "core" of the farm includes the Northern Dancer Cemetery, The Arena and the Old Stud Barn, Barn 2, Barn 6, and the New Stallion Barn. The land that these buildings and the cemetery are situated on is now owned by UOIT, and will be incorporated into the Campus Master Plan, which is currently being developed. ▪ The other horses buried in The Northern Dancer Cemetery include: Archers Bay, Ascot Knight, Ballade, Canadiana, Cats At Home, New Providence, South Ocean, Vice Regent, Victoria Park and Windfields. ▪ Windfields Farm has a rich and exciting history, linked to two very affluent Canadian families who built their businesses in Oshawa, Ontario. ▪ Parkwood Stables was established in 1927 by the first important family to own the property, Colonel R. S. McLaughlin, the founding President of General Motors of Canada. Later, in 1950, Parkwood Stables was purchased by E.P. Taylor. ▪ Two of the barns that are now located at Windfields Farm were originally built between 1914 and 1917 on Parkwood Estate, located at 270 Simcoe Street North, Oshawa, Ontario. The barn we refer to as Barn 2, as well as the large indoor arena and attached stable (the old stud barn), are the barns we are referring to. In 1935 they were dismantled; in some cases, stone by stone; marked and rebuilt at the property on Simcoe Street North, now known as Windfields Farm. These buildings were moved from Parkwood Estate to make room for the addition of the reflecting pool and fountain of the Formal Garden area. ▪ The Arena was primarily used as a breeding shed. It was also used as a place to break difficult yearlings; the horse could be contained within the arena if it unseated its rider. ▪ Stallion showings would also take place in this building. It would be transformed with tapestries and seating. ▪ Due to the short stature of Northern Dancer, it was believed to be beneficial to breed him to larger mares so that together they would produce larger offspring. Lacking in height, Northern Dancer required help reaching a mare for breeding. Therefore, a pit was dug in the dirt floor of the Arena, lined with outdoor carpet to aid in traction, (this was later changed to rubberized carpet) and then the mare would be positioned at the lowest point in the pit. This was the only way he was able to reach to breed the mares. * There is no artificial insemination in thoroughbred breeding; only natural cover is allowed. ▪ Northern Dancer’s stud fee near the end of his career was $250,000-$500,000.00, with no guarantee of a foal. ▪ There was also a lower laboratory attached to the Arena and the Old Stallion Barn. This lab was used to collect dismount specimen from the stallions at stud. This would be checked for sperm count and mobility. It would be collected and passed through a window where it would be checked and recorded. ▪ The Laboratory was located above the Old Stud Barn and occupied three rooms. The rooms were used for Biochemistry, Microbiology and Haematology. ▪ Mares, stallions, foals, weanlings, yearlings and racehorses received first rate care at Windfields Farm. Prevention was the key to having a healthy population of thoroughbreds. The highly trained staff, combined with a well-equipped and modern laboratory, helped to keep the horses monitored on a constant basis. Many tests were done routinely on the population, which often exceeded over 500 horses. ▪ Originally Barn 2 was used for breaking yearlings within the barn itself. The barn is shaped in an oval, with the stalls being located in the middle of the barn. The yearlings would jog around the corridor, until they were ready to jog on the track outdoors or within the arena. ▪ Later Barn 2 was used as a transient barn for outside mares being brought in to be bred by Windfields Farm’s stallions. Quarantining the mares would ensure that Windfields horses were not at risk. ▪ There are also offices attached to the south side of Barn 2. The lower level office was for the manager, while the offices located on the second floor were for the secretaries of Windfields Farm. ▪ Also known as ‘the Foaling Barn’, this building was built during the Parkwood Stables period, probably in the 1930's. The north two-thirds of the building appear to have been constructed first and then the south one third being a later addition. (Unterman Mc Phail 2002) Numerous greats such as Northern Dancer, the Minstrel, Bridle Path and Vice Regent were born in this barn. ▪ The New Stallion Barn was built in the 1960's. It housed many successful stallions during the Windfields Farm era. The stallions would travel a short distance across a path to the breeding shed (Arena) to breed the mares. ▪ There were once beautiful paddocks north of the barn, where horses were turned out to play and graze daily. ▪ There was a sitting room located on the east side of this barn. Heritage Impact Study Report, Windfields Farm Limited, City of Oshawa, Ontario. Presented to Windfields Farm Limited, November 2002. Prepared by Unterman McPhail Associates, Heritage Resource Management Consultants. • Mr. Taylor bought Iribelle from Dr. T. H. Callahan of Toronto. Although she won only $2,190 and was just stakes placed, Iribelle made a lasting impression on Taylor's fortunes. In an abbreviated career, Iribelle produced only four foals, three of them fillies. Yet she is responsible, in direct descent, for champions Victoria Park, Viceregal, Canadiana, Northern Queen, Northern Blossom, Ben Fab, Jape and Tan Bonita plus leading sire Vice Regent, sire of champions Deputy Minister, Regal Classic, Bessarabian, and Ruling Angel. • Of Iribelle's four named foals, three were stakes winners - the gelding Bennington by Boswell; the Bunty Lawless filly Britannia who won the Coronation and Princess Elizabeth Stakes and placed in the King's Plate; and Canadian champion Canadiana, a daughter of Chop Chop. The odds against a mare who produced only four foals being responsible for such a legacy must be astronomical, but Iribelle beat those odds and foaled a dynasty. • E. P. Taylor bought Chop Chop at a dispersal sale and stood him at his National Stud of Canada in Oshawa, Ontario. Mated to Taylor's mare, Iribelle, their daughter Canadiana was foaled in 1950. Canadiana's success in racing resulted in Chop Chop being bred to the best of the Taylor mares and as a consequence, he was the leading sire in Canada from 1959 through 1963. ∙ Blue Light (b. 1958) - won 1961 Queen's Plate. • Through his daughter, Ciboulette, Chop Chop was the damsire of Eclipse and Sovereign Award winner and Canadian Horse Racing Hall of Fame inductee, Fanfreluche. • For his Contribution to Canadian racing, in 1977 Chop Chop was inducted in the Canadian Horse Racing Hall of Fame. • Evensong was bred to Victoria Park and produced one foal named Song of Victory. • By far, Lady Angela is the most important horse in this cemetery. Lady Angela is the matriarch of the world’s greatest Thoroughbreds past, present, and future! • Lady Angela was purchased by E.P Taylor in 1952 at the sale in Newmarket, England. She was in foal to Nearco and produced a foal named Empire Day. Mr. Taylor had her bred back to Nearco before he had her shipped to his farm in Canada and in 1954 wherein she produced a foal named Nearctic. Nearctic received the 1958 Sovereign Award for Horse of the Year. Nearctic also went on to sire Northern Dancer. • Even if she were the only horse buried in this cemetery, her importance in the way Thoroughbred bloodlines developed due to her influence is enough to preserve and protect it forever. • Flaring Top was the dam of Flaming Page who was the dam of Fleur. Fleur was mated with Northern Dancer and the result was The Minstrel. Flaming Page was also mated with Northern Dancer and the result of that mating was Nijinsky II. Nijinsky II was historically important for establishing Northern Dancer's reputation in Europe because as a two year old he was unbeaten in 5 starts, and he won the English Triple Crown as a three year old. When he retired to stud, he became Leading Sire in Great Britain and Ireland and Leading Broodmare Sire in North America. • Shake A Leg had one foal by Northern Dancer named Danzatore. • Deceit was one of Mr. Taylor's great race-mares who won many important races in the U.S.A.
• She won the first two races of the Triple Tiara (the filly equivalent of the Triple Crown) as a three year old. She was bred to many great stallions, including Northern Dancer, but it was her mating with Vice Regent that produced Deceit Dancer who was the 1984 Canadian Champion 2 year old filly. • Gliding In's sire was First Landing, who was a great grandson of Nearco. • She had 12 foals, 11 of them making it to the races. Her highest earning offspring was a colt named Society Island whose sire was Vice Regent. Gliding in was a long-time resident of the farm, and was owned by George Strawbridge who was a very important client and supporter of Windfields Farm. • Mudpuddle was the first riding horse purchased by Charles Taylor and he gave the colt to his daughter Nadina. • Bridle Path won the 1979 Breeders Stakes. He was ridden by Sandy Hawley and trained by Macdonald Benson. • Dancing Angela's grandfather (on her dam's side) was Nearctic. • She had 13 foals, 10 of them making it to the races. Her most notable offspring was Le Danseur. • Tabaret was a daughter of Viceregal ( full brother to Vice Regent). • She had 13 foals, 10 of them making it to the races. Her most notable offspring was a filly named Halo's Princess. • Philip was E.P Taylor's riding horse. When the Taylor family moved from the estate on Bayview, Judy Mappin gave the horse to Muriel Lennox. • Moose was Judy Mappin’s horse. He was originally E.P Taylor's riding horse. • Clyde was Charles Mappin's riding horse. • Archers Bay was a Canadian Thoroughbred racehorse known for winning the first two legs of the 1998 Canadian Triple Crown. He was sired by Silver Deputy and out of the stakes-winning mare, Adorned, a daughter of the 1975 French Derby winner, Val de l'Orne. • In the 1998 Canadian Triple Crown series, Archers Bay won the Queen's Plate and the Prince of Wales Stakes but did not run in the final leg, as the Breeders Stakes is a test on turf. He was voted Canadian Champion Three-Year-Old Male Horse. • Retired to stud duty, Archers Bay sired Arch Hall and other foals. • The stallion was humanely euthanized in 2002 after an unsuccessful colic surgery and is buried on the farm. • The 24 year old son of Danzig-Bambee T.T., by Better Bee, has sired 32 stakes winners and horses that have earned more than $28 million. These include champion Pennyhill Park(G2), Italian Derby(G1) winner Bahamian Knight, Canadian Oaks winner Plenty Of Sugar, Breeder's Stakes winner Pinafore Park and additional SWs Influent(G1), Hey Hazel(G2), Ascot Yael(G2), Reclaim(G2), Cheery Knight(G2) and Scotman(G3). • Bred in Canada by Bob Anderson, Ascot Knight was purchased by Gainsborough Farm for $1,400,000 at the Keeneland July Yearling sale in 1985. He was sent to England where he won or placed in seven of ten starts, including a victory in the Mecca Bookmaker's Scottish Derby and placing in 4 graded stakes including a second in the Matchmaker International, before retiring to stud at Windfields for the 1989 season. • Ballade was an extremely important broodmare for Windfields Farm. She produced numerous champions including such greats as Glorious Song, Devil's Bag, and Saint Ballado, to name a few. Her son, Imperial Falcon, whose sire was Northern Dancer, sold as a yearling at Keenland for 8.25 million dollars. Ballade was euthanized at Brookdale Farm in Kentucky, and a gravestone was placed in the main cemetery at Windfields Farm to commemorate her importance. • Canadiana was the first Canadian-bred racehorse to earn more than $100,000 Canadian dollars. She was bred by E. P. Taylor at his National Stud near Oshawa, Ontario. Sired by Taylor's stallion, Chop Chop, (who would go on to sire three more Queen's Plate winners) her dam Iribelle was also owned by Taylor. • Canadiana's British-born damsire Osiris was the leading sire in Canada in 1938, 1940, 1942, and 1947. • Trained by Gordon J. "Pete" McCann, at age two, Canadiana was not only the dominant horse of her age group, female or male; she was the dominant horse irrespective of age. She won the top races for her age group in Canada and set a new track record for 5½ furlongs in winning a stakes race event at Randall Park Race Track in North Randall, Ohio. She was voted 1952 Canadian Horse of the Year honors. At age three, Canadiana ran fourth in the Plate Trial Stakes but returned to form to beat male horses again, scoring a five-length victory under future U.S. Racing Hall of Fame jockey Eddie Arcaro in Canada's most prestigious race, the Queen's Plate. She went on to win against fillies in the Test Stakes at Saratoga Race Course in Saratoga Springs, New York. • As a four-year-old, Canadiana raced against some of the top fillies in the United States. Her best results were a win of the 1954 Vagrancy Handicap at Aqueduct Racetrack in Queens, New York and seconds in the Gazelle and Diana Handicaps. Canadiana raced as a five-year-old, winning the Highlander and Jacques Cartier Stakes at Woodbine. • Retired to broodmare duty at Windfields Farm, Canadiana produced six foals but only one became a stakes-race winner. • In 1978, Canadiana was inducted in the Canadian Horse Racing Hall of Fame. • The 10-year-old son of Tabasco Cat was owned by Windfields and his breeder/owner, Edward P. Evans. • Cat's At Home was represented in 2006 by stakes winner Spread the News and stakes-placed River Barrow. • As a racehorse, Cat's At Home won five stakes, including the Philip H. Iselin (gr. II), Excelsior Breeders' Cup (gr. III), and Westchester (gr. III) Handicaps. All three of his stakes-placings came in graded events. He retired with nine wins from 31 races and earnings of $708,575 for trainer Mark Hennig. • Cat's At Home, who was once Canada's leading freshman sire, died suddenly March 24, at Windfields Farm near Oshawa, Ontario, Canada. • New Providence became the first official winner of the Canadian Triple Crown in 1959. • Retired to stud duty at owner E. P. Taylor's Windfields Farm in Oshawa, Ontario, he met with reasonable success and is best known as the damsire of European Champion Storm Bird, who in turn sired Storm Cat. • A daughter of New Providence, she went on to produce two prominent thoroughbreds in Storm Bird and Northernette. • Vice Regent was a Canadian Hall of Fame Thoroughbred racehorse and Canada’s leading sire for thirteen years. Owned and bred by E. P. Taylor, he was from Northern Dancer's second crop and out of the mare Victoria Regina. • Vice Regent was a full brother to Viceregal who earned Canadian Horse of the Year honors as a two-year-old in 1968. As such, on his debut one year later in 1969, much was expected from Vice Regent. Conditioned by future Hall of Fame trainer Gordon J. McCann, as a result of injuries and an accident, Vice Regent raced only five times before being forced into retirement. • Standing at stud at Windfields Farm, his outstanding performance as a sire earned him a 1989 induction in the Canadian Horse Racing Hall of Fame. During his career, Vice Regent produced four hundred foals, of which sixty were stakes winners. • Victoria Park was a grandson of American Triple Crown champion Gallant Fox. He was the first Canadian-bred horse to place in an American Triple Crown race. At age two, the colt won the Clarendon Stakes plus the two richest 2-year-old races in Canada, the Coronation Futurity Stakes and Cup and Saucer Stakes, and was voted Canadian Champion 2-Yr-Old Colt. • Victoria Park finished 3rd behind Venetian Way in the 1960 Kentucky Derby. In the Preakness Stakes, he finished 2nd to Bally Ache, whom he had beaten in the Leonard Richards Stakes while setting a new Hialeah Park track record. He bypassed the Belmont Stakes to return for Canada's most important race, the Queen's Plate, which Victoria Park won in a record time that stood for more than forty years. He was voted 1960's Canadian Champion 3 year old Colt and Canadian Horse of the Year. • Retired to stud, Victoria Park sired 25 stakes winners, including three Queen's Plate winners: Almoner (1970), Kennedy Road (1971), and Victoria Song (1972). He is the damsire of The Minstrel as well as the damsire of Northern Taste, who led the Japanese leading sires list for ten years, and topped the broodmare sires list a number of times. • On its formation in 1976, Victoria Park was inducted into the Canadian Horse Racing Hall of Fame. • Windfields was a Canadian Hall of Fame Thoroughbred racehorse who was the first stakes race winner bred by E. P. Taylor and for whom he would name his world famous Windfields Farm. • Out of the mare, Nandi,  for whom the Nandi Stakes at Woodbine Racetrack is named, Windfields was sired by Bunty Lawless, who in 1951 was voted Canada's "Horse of the Half-Century." • Trained by Bert Alexandra, as a two-year-old in 1945 Windfields won his first start by six lengths then won the five furlong Victoria Stakes in a time of 0:59.00, breaking Faireno's track record at Old Woodbine Racetrack by 3/5 of a second. The colt followed this win with another track record in the Rosedale Purse but then suffered a knee injury that kept him out of racing. • Ineligible for Canada's most prestigious race, the Kings Plate for three-year-olds, in September 1946 the three-year-old Windfields would defeat Plate winner Kingarvie by five lengths in the 1946 Breeders' Stakes. Although never a great racehorse, Windfields went on to compete through age six, notably defeating the great Australian runner Shannon, to win a stakes race on January 25, 1948 at Santa Anita Park in Arcadia, California. • Retired to stud duty, it was as a stallion that Windfields made his real contribution to racing. He sired fifteen stakes winners, including 1956 Canadian Triple Crown winner and Hall of Fame inductee, Canadian Champ. Through his daughter Victoriana, who produced seven winners, Windfields was the damsire of the good filly, Northern Queen, and Canadian Horse of the Year and Hall of Fame inductee, Victoria Park. Through another daughter, Windfields was the damsire of Cool Reception, the 1996 Canadian Champion 2-Year-Old Colt and Hall of Fame inductee. • On May 27, 1961 at 12:15 am, Natalma gave birth to a bay colt by Neartic, at E.P Taylor's National Stud Farm in Oshawa, Ontario. This is the day that the Thoroughbred world was forever changed, as that bay colt was none other than Northern Dancer. • As a yearling, Northern Dancer weighed in at roughly 955 lbs., which was just slightly below average compared to his stable-mates. He was by far the shortest at 14 hands 2.5 inches. •On September 17, 1962 the annual pre-priced yearling sale was held at E.P Taylor's Windfields Farm located in Willowdale, a suburb of Toronto. Northern Dancer was one of two colts priced at $25,000. The other a big, rangy colt later named Brockton Boy was purchased, while the short, stocky Northern Dancer was left behind to become part of Mr. Taylor's racing stable. • After being broke, the process in which a horse learns to have a saddle, bridle and rider on him, he was sent to Woodbine racetrack under the care of Horatio Luro. On August 2, 1963 he had his first start in a 5 1/2 furlong maiden race at Fort Erie Racetrack. He was ridden by apprentice jockey Ron Turcotte, and easily won by 7 lengths. Up until this point, he had not really been noticed by anyone, but after this win he was being hailed as Windfields best 2 year old and one to watch. He unfortunately lost his next start in the Vandal Stakes by four lengths to a well-seasoned horse named Ramblin Road. The horse that ran third, behind Northern Dancer, was a horse named Brockton Boy who just so happened to be the other yearling colt who was offered for sale, and purchased for $25,000 at Mr. Taylor's yearling sale the previous year. Northern Dancer went on to win 14 of his 18 starts at age 2 and 3. He accumulated a total of $580,806 and was never unplaced. On May 2, 1964 Canada's greatest victory in horse racing is achieved when Northern Dancer, (with Bill Hartack aboard) beats Hill Rise (with Bill Shoemaker aboard) by a neck in the Kentucky Derby. He not only beat him, but set a Derby record, 2:00 minutes flat for the mile and a quarter. On May 16, 1964 Northern Dancer heads to the Preakness Stakes in Baltimore and beats The Scoundrel by two lengths with Hill Rise coming in third. On June 6, 1964 he heads to the Belmont Stakes where sadly he was beaten by Quadrangle and Roman Brother to end up third. On June 20, 1964 Northern Dancer headed back to Canada to run and win the Queens Plate. He galloped to an easy 7 length victory in front of a packed house at Woodbine Racetrack. After the Plate, he headed back to Belmont Park to prepare for the $100,000 Classic at Arlington Park in Chicago. On July 30, 1964 during his final workout at Belmont Park he suffered an injury to his left front tendon. The plans to head to Arlington were scrapped, and he was given time to rest. On November 6th, 1964 E.P Taylor announced NorthernDancers retirement and he is sent to stud. • On Feb.17, 1965 Northern Dancer is bred to his first mare. A mare named Flaming Page who unfortunately loses dead twins the following year. Northern Dancer’s first live foal is born on April 4th, 1966. He was a chestnut colt, later named Viceregal. • On January 26, 1968 Northern Dancer's first starter became his first winner. A filly named "Jitterbug" ran at Hialeah, leading gate to wire and winning easily. Northern Dancer achieved as a racehorse was soon overshadowed by his success as a stallion. He became leading sire in the world in 1970 and it is estimated that 75% of thoroughbred racehorses in this day can be traced back to him. Two of the most recent superstars tracing back to him are Frankel and Black Caviar. • Northern Dancer was retired from stud duties in 1987 at the age of 26. He died in 1990 at the age of 29 and was transported from Windfields Farm, Maryland to Windfields Farm, Oshawa in a large pine coffin. He now rests only a few meters from Barn 6, where his legacy began. For the summary written below, we shall refer to this house as it is named within the Unterman McPhail Associates Report, November 2002 - K-58 House 30/31-Foreman's House. • K-58: House 30/31 is situated to the south of the main drive from Simcoe Street. Set on an open lot, the drive to the north is lined with hedges and mature trees. Paddocks are located to the south. The residence is visible from Simcoe Street and stands out because of the distinctive roof and stone detailing. It appears to have been sited to relate to the stone house across Simcoe Street. • Land records indicate Elizabeth Symington 2nd received the Crown Patent for all of Lot 12 in 1801. Andrew Masson 3rd bought all 200 acres from Thomas Atkinson in 1826. His son, Andrew Masson Jr. acquired the lot in 1853. Tremaine's map (1860) shows A. J. Masson as the occupant of the lot with a house shown in middle on Simcoe Street. George J. Masson took over the property in 1864. The Illustrated Historical Atlas map (1877) notes G. J. Mason as the owner of Lot 12 with a house located on Simcoe Street in the middle of the lot. Land records note William Manning bought all of Lot 12 from George Masson in 1891. Goad's map (1895) depicts William Manning as the owner of 214 acres. The Census Return (1901) notes William Hobbs and family as the leasers of 240 acres of Lot 12. • The Trust & Guarantee Co. Ltd. took over the property from Manning in 1905, selling all 214 acres to William Hobbs in 1907. George W. McLaughlin bought 214 acres from Hobbs in 1917 and sold it to his son Robert Ray McLaughlin in 1919. This site became the centre of Ray McLaughlin's Elmcroft Farm. E. P. Taylor's National Stud Farm bought Elmcroft Farm in 1956. • George W. McLaughlin (1869-1942) was the son of Robert McLaughlin, founder of the McLaughlin Carriage Company and brother of Robert Samuel McLaughlin, President and General Manager of General Motors. George W. was also a prominent businessman in his own right serving as Vice-President of General Motors of Canada and its predecessor companies of McLaughlin Motor Car Company and Chevrolet Motor Company. He retired from General Motors in 1924 and took on the management of the family's farm properties in Tyrone and north of Oshawa. McLaughlin was well-respected in the agricultural community. He and his wife Annie Hodgson had four children including Robert Ray McLaughlin. • Robert Ray McLaughlin (1895-1949) was born in Oshawa and attended the local public and high schools. George W. McLaughlin acquired the Masson farmstead on Simcoe Street in 1917 on Lot 12, Concession 5. His son Ray McLaughlin lived at and managed Elmcroft Farm for over 30 years. Elmcroft Farm expanded its holdings beyond Lot 12 over the years acquiring land in Lots 11, 13, 14 and 15. • Elmcroft specialized in livestock breeding and operated a well-known Ontario dairy farm. Elmcroft Farm was one of the heaviest milk shippers in Ontario with most going to the Oshawa Dairy. Ray McLaughlin developed a Holstein dairy herd that was internationally renowned. He sold cattle to Argentina and other South American countries. He served on the executive of the Holstein-Friesian Association for twenty-five years. Ray McLaughlin was also interested in raising Clydesdale horses, winning the Grand Championship at the 1946 Royal Winter Fair in Toronto. McLaughlin also did volunteer work with the Oshawa Boy Scouts organization. Upon his father's death in 1942, Ray McLaughlin took over the management of the original Robert McLaughlin farmstead in Tyrone, which was run separately from Elmcroft Farm. • On September 23, 1948, Ray McLaughlin was killed on his farm by a premature blast of dynamite. The funeral was held at Elmcroft Farm. His son, George R. McLaughlin, took over the farm operations and continued to run it until November 1956 when the National Stud Farm purchased 438 acres of Elmcroft Farm in Lots 11, 12 and 13, Concession 5, including the buildings thereon. McLaughlin sold his last five acres to the National Stud Farm in 1960. 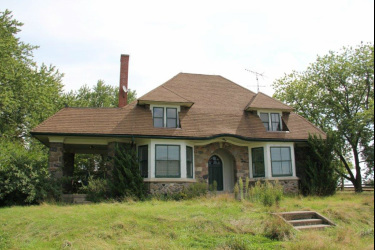 • K-58: House 30/31, Foreman's House was built in the late 1920s. The Journal of the Royal Architectural Institute of Canada (1928) contains a "Birdseye view of the Farm of Geo. N. McLaughlin, Esq., Oshawa, Ont., showing Foreman's Cottage in Foreground" by Wickson & Gregg, Architect's. The one and-a-half storey stone house, built in a picturesque Bungalow style, appears to have undergone few exterior changes. • Toronto architects Wickson and Gregg designed the residence K-58: House 30/31 as the Foreman's House for Elmcroft Farm around 1917. *All information was taken from the Heritage Impact Study Report (November 2002) conducted by Unterman McPhail Associates. Windfields Farm has a rich and exciting history, linked to two very affluent families who lived in Oshawa, Ontario. The first important family to own the property - and even before the Windfields property, to have built the barns - was Colonel R. S. McLaughlin, the founding President of General Motors of Canada. "By early 1915, The McLaughlins had achieved "First Family" status in Oshawa and purchased the former Prospect Park to be the site of their new home. Parkwood was born of a collaboration between Sam McLaughlin, his wife Adelaide, and the best artists, architects and landscape designers of the time." taken from The R.S. McLaughlin Estate Parkwood, National Historic Site. Two of the barns located at Windfields Farm were originally built between 1914 and 1917 at Parkwood Estate, located at 270 Simcoe Street North, Oshawa, Ontario. The arena and stable associated with the main structure at Windfields, was on the Parkwood property until the reflecting pool and fountain of the Formal Garden area was added in 1935. What we refer to as Barn 2 as well as the large indoor arena were once located at the Estate, before they were dismantled; in some cases, stone by stone; marked and rebuilt at the property on Simcoe Street North, now known as Windfields Farm. On May 27, 1961 at 12:15 am, Natalma gives birth to a bay colt by Neartic at E.P Taylor's National Stud Farm in Oshawa, Ontario. This is the day that the thoroughbred world was forever changed, as that bay colt was none other than Northern Dancer. As a yearling, Northern Dancer weighed in at roughly 955 lbs., which was just slightly below average compared to his stable-mates. He was by far the shortest at 14 hands 2.5 inches. On September 17, 1962 the annual pre-priced yearling sale was held at E.P Taylor's Windfields Farm located in Willowdale, a suburb of Toronto. Northern Dancer was one of two colts priced at $25,000. The other a big, rangy colt later named Brockton Boy was purchased, while the short, stocky Northern Dancer was left behind to become part of Mr. Taylor's racing stable. Windfields best 2 year old and one to watch. Unfortunately he lost his next start in the Vandal Stakes by four lengths to a well-seasoned horse named Ramblin Road. The horse that ran third, behind Northern Dancer, was a horse named Brockton Boy who just so happened to be the other yearling colt who was offered for sale, and purchased for $25,000 at Mr. Taylor's yearling sale the previous year. Northern Dancer went on to win 14 of his 18 starts at age 2 and 3. He accumulated a total of $580,806 and was never unplaced. On May 2, 1964 Canada's greatest victory in horse racing is achieved when Northern Dancer, (with Bill Hartack aboard) beats Hill Rise (with Bill Shoemaker aboard) by a neck in the Kentucky Derby. He not only beat him, but set a Derby record, 2:00 minutes flat for the mile and a quarter. On May 16, 1964 Northern Dancer headed to the Preakness Stakes in Baltimore and beats The Scoundrel by two lengths with Hill Rise coming in third. On June 6, 1964 he heads to the Belmont Stakes where sadly he was beaten by Quadrangle and Roman Brother to end up third. On June 20, 1964, Northern Dancer headed back to Canada to run and win the Queens Plate. He galloped to an easy 7 length victory in front of a packed house at Woodbine Racetrack. After the Plate, he headed back to Belmont Park to prepare for the $100,000 Classic at Arlington Park in Chicago. On July 30, 1964 during his final workout at Belmont Park he suffered an injury to his left front tendon. The plans to head to Arlington were scrapped, and he was given time to rest. On November 6th, 1964 E.P Taylor announced Northern Dancer's retirement and he is sent to stud. On Feb.17, 1965 Northern Dancer is bred to his first mare. A mare named Flaming Page who unfortunately loses dead twins the following year. Northern Dancer's first live foal is born on April 4th, 1966. He was a chestnut colt, later named Viceregal. On January 26, 1968 Northern Dancer's first starter became his first winner. A filly named "Jitterbug" ran at Hialeah, leading gate to wire and winning easily. Northern Dancer spent the1965 to1968 breeding seasons standing at stud at E.P Taylor's Windfields Farm, Oshawa (previously known as National Stud Farm). He was moved to Windfields Farm, Maryland in December of 1968 for the 1969 breeding season with an increase in his fee to $15,000. Any success Northern Dancer achieved as a racehorse was soon overshadowed by his success as a stallion. He became leading sire in the world in 1970 and it is estimated that 75% of thoroughbred racehorses in this day can be traced back to him. Two of the most recent superstars tracing back to him are Frankel and Black Caviar. Northern Dancer was retired from stud duties in 1987 at the age of 26. He died in 1990 at the age of 29 and was transported from Windfields Farm, Maryland to Windfields Farm, Oshawa in a large pine coffin. He now rests only a few meters from Barn 6, where his legacy began. Windfields Farm in 1968 promoting Northern Dancer.